It was admissions day. All across the country, hopeful high schoolers were receiving letters about college decisions, and some of them were destined for UC Berkeley. We smiled at the prospect of these baby Bears joining one of the best campuses in the world. They have four amazing years of learning ahead of them. They were so lucky. At least, that’s what we thought at first. We paused to think. Grade deflation? Insanity? For three years at UC Berkeley, we had accepted the academic rigor as a way of life. We had always thought that going to a top-tier school meant a heavy work load and, at times, disappointing grades. We had never stopped to think that UC Berkeley could be the exception — and not in a good way. A simple Google search shows how many other students have the same concerns as the girl from my high school, as links to posts titled “Berkeley and it’s infamous GPA deflation,” “Does grade deflation really exist at Berkeley?” and “Do graduate schools know/care about Cal’s grade deflation?” all appear. As it turns out, UC Berkeley’s policies lie in stark contrast to those of other well-reputed schools across the country. In 2001, Harvard University was heavily criticized by the Boston Globe when more than 90 percent of its class graduated with honors. But this isn’t uncommon. In the 2012-13 academic year, A’s made up 53.4 percent of all grades at Brown University. At Yale University, the ad hoc committee on grading found that between 2010 and 2012, 62 percent of all grades were in the A-range. Though these numbers are surprising, they follow a general upward trend in grading, which started in the 1960s. Since the 1960s, grades at private institutions have increased at an average rate of 0.15 grade points per decade. One of the most persistent theories explaining this revolves around the Vietnam War. Because flunking a course or being suspended from college would make a student eligible to be drafted into the military, the argument claims that anti-war professors began passing students who otherwise would have failed. This theory, however, only marginally explains the trend. As it turns out, the increase was mainly seen in A’s and B’s, not in lower grades. Others attribute the higher grades to aggressive students and cowardly professors. 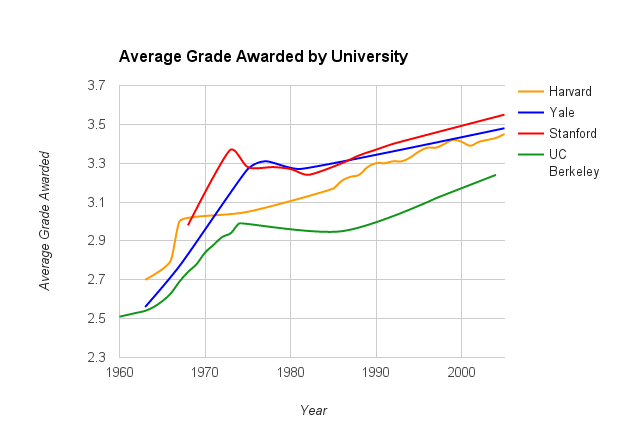 Whatever the reason may be, the fact remains that grade inflation is real and is possibly getting worse. In 2004, in an attempt to curb grade inflation, Princeton University’s faculty senate passed a resolution that asked all departments to restrict the number of A-range grades to no more than 35 percent of all grades given. 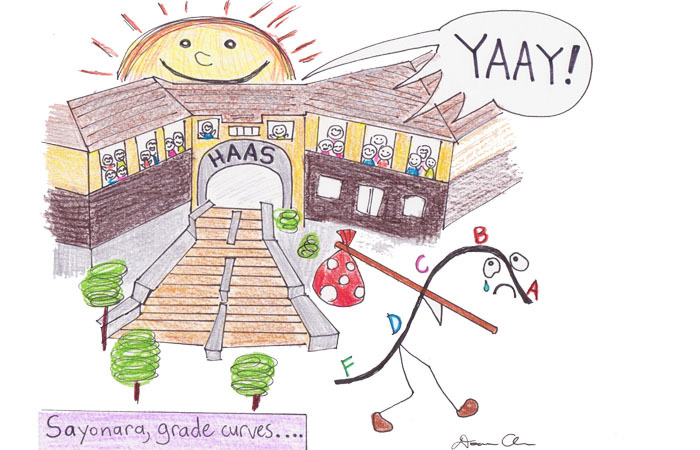 Though it was not a hard quota, sufficient pressure was put on all departments to significantly decrease the number of A-range grades handed out. But not every department brought its share of A’s quite to 35 percent. A follow-up study done in 2014 shows that only two departments are actually below the target: economics and physics. A few others, including molecular biology, sit just above the target, while humanities classes in general see much higher grades. Though there is much controversy over Princeton’s grade-deflation policies, they are still a far cry from the policies here at UC Berkeley, at which some science classes require that no more than 15-20 percent of grades given be A’s, leading to a stark difference between the average graduating GPA from UC Berkeley as compared with that of elite private institutions. Regardless of the disparity among departments, the fact remains that UC Berkeley students are getting fewer A’s than their counterparts at private institutions. The National Association of Colleges and Employers found that 66 percent of employers screen candidates by analyzing their GPA. Most professionals state that they take a holistic approach in assessing candidates, be it for higher education or job applications. In reality, however, it is almost impossible to eliminate the correspondence bias, in which an evaluator attributes too much to a candidate’s disposition and too little to the situation. What the researchers found was that high-performing students from low-GPA schools were given lower ratings than under-performing candidates from high-GPA schools. Applicants from schools with higher average grades are thus more likely to be accepted just because their GPAs are higher, regardless of their personal skill level and the difference in grade distributions between schools. This, clearly, is a cause for concern for students at institutions with tougher grading standards. Black agreed. “Haas as a brand name definitely gets you in the door at many job interviews,” he says. The fact of the matter is that your GPA is just a number — perhaps a slightly lower number than it would have been at certain elite private institutions, but still only a number. At the end of the day, UC Berkeley’s fantastic reputation will get you that interview. And even if it doesn’t, your friends and family are still impressed that you go to the best public school in the world.